As an engineering company, we hold safety, health, environment and quality in high regard. These core values solidify the foundations of our business, meaning the high standards we promise to our clients are always followed through with the best possible support. Unwavering in their focus and commitment. Integration of H&S into design activities to apply the principles of prevention, thus reducing risks at source. Clearly planned and communicated work standards, plus behavioural expectations supported by strong supervision. Regular oversight to ensure our values are being put into practise. Our latest initiative, as seen pictured above, is to install a PPE reminder into all our vans. 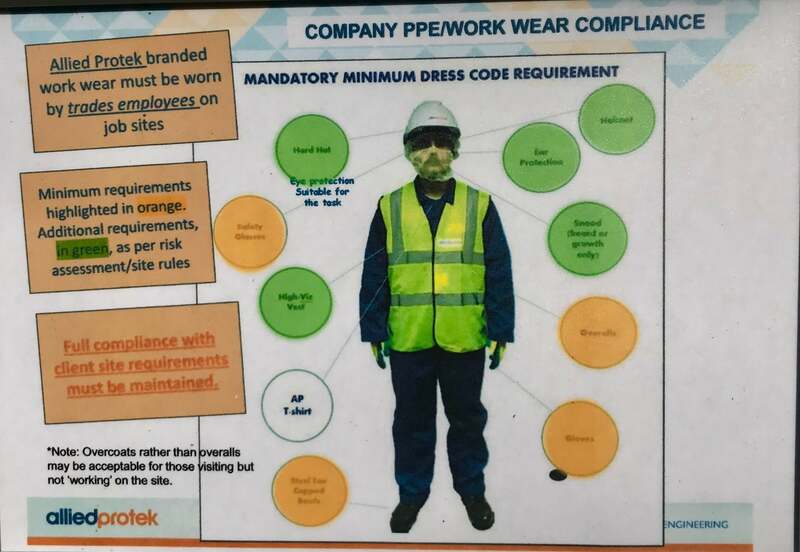 The logic behind this latest instalment within Allied Protek is to remind our tradesmen of our strict PPE standards to ensure the health and safety of both our workforce and our clients.